Using this foolproof method of poaching chicken breast you will never again end up with a dry, overcooked chicken! Honestly, poaching chicken breast is one of the most difficult things to master, even the experts use thermometers to get it exactly right, or they use fancy techniques like sous-vide (sealing meat in vacuum packs and submerging them in hot water maintained at an exact temperature). The home method is so simple and no fail. All you do is bring water/stock to boil, place the chicken in water, bring it to boil again, remove from heat and leave it to cook in the residual heat. Everytime I make this, I stress that the chicken won’t cook through – but it always works! Always. The chicken breast is just cooked through, and is incredibly moist. 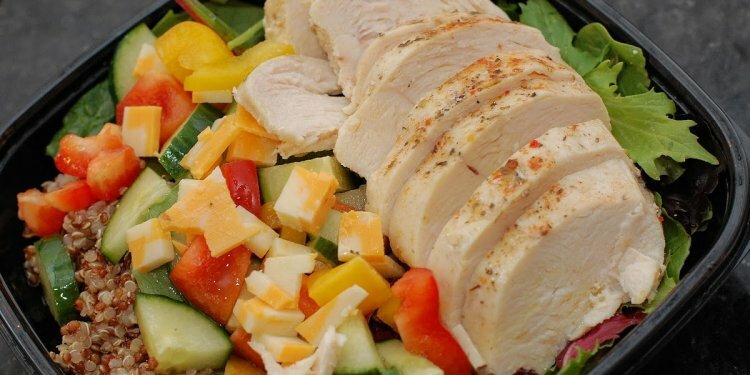 It is so juicy you can eat it plain – and that’s saying something for chicken breast! Using this method also flavours the stock it’s cooked in which is an added benefit, so it’s perfect to use as the base for a noodle soup. Though the recipe shows that it takes 30 minutes to cook, only 5 minutes of this requires requires the stove to be on! This is a fantastic mid week meal that’s effortless but oh-so-tasty and satisfying. Hope you give it a go! This recipe uses a foolproof method of poaching chicken breast so you'll never, ever overcook it. The soup stock is a refreshingly light and the flavour is enhanced by poaching the chicken in the same liquid. A perfect super fast, low maintenance mid week meal! Combine Soup Stock ingredients in a medium saucepan large enough to hold the 2 chicken breasts side by side (without being crammed in). Bring to boil, taste and adjust if necessary. Add chicken to soup, bring back to boil. Remove from heat and put aside covered for 20 - 25 mins. Don't worry if you leave it for longer, it won't over cook. When the chicken is poached, remove from the soup and slice into ¼" / 0.5cm slices. Cook noodles according to the packet instructions - usually for fresh noodles soaking them in boiling water is sufficient. Cut the bok choy leaves from the stems, cut the stems vertically into ⅓" / 1cm wide sticks. Bring the soup (without the poached chicken in it) back to boil, add the bok choy stems, boil for 30 seconds then remove from heat, add the bok choy leaves and bean sprouts. To assemble place noodles in bowl, top with bok choy, chicken and spoon over soup. Garnish with scallions/shallots and fried shallots. 1. You can cook 2 chicken breasts (up to 10oz/300g each) with the amount of liquid used in this recipe. However, you will probably only need 1 chicken breast to top 2 servings of noodle soup. 2. You can use dried egg noodles if you wish. Just cook the noodles per the packet instructions - you can even cook it in the soup stock (after poaching the chicken) but note that the starch in the noodles will probably thicken the soup slightly (you may actually prefer this). Also you should add an extra ½ cup of water because the noodles will absorb liquid when cooking. 3. 7oz / 200g chicken breast will take about 20 minutes to cook, 10oz / 300g takes about 25 minutes. Don't worry if you leave it for longer, it doesn't need to be exact. The chicken will not overcook as the soup won't be hot enough. 4. You can get Fried Asian Shallots in the asian section of large supermarkets. They are slices of scallions that have been deep fried and seasoned, and they add lovely texture and flavour to soup.